Find new items first on eBay™ before anyone else. 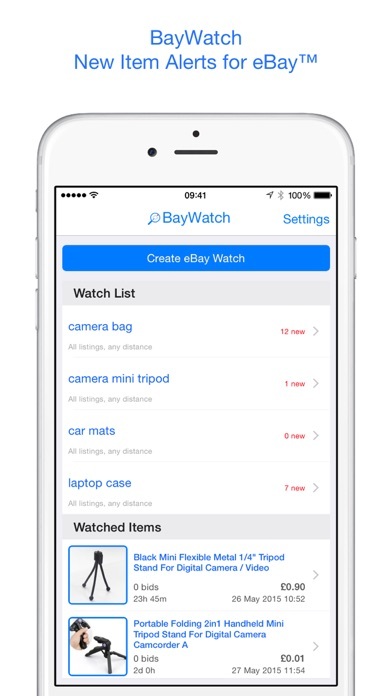 BayWatch monitors eBay and alerts you as new items are found. 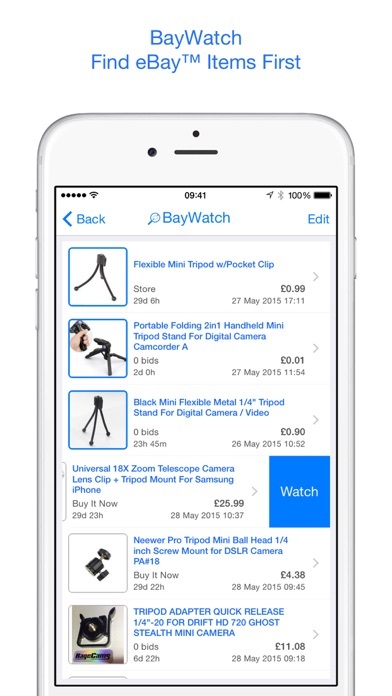 Simply create your watch, and BayWatch will alert you as new items matching your search are found on eBay. BayWatch also lets you simply browse eBay. No need to jump back and forth between eBay and BayWatch. View eBay item details, price, bids, description, pictures, and simply tap on Shop Now to head over to eBay and purchase. Watch individual eBay items that interest you, and receive alerts before the eBay listing ends, allowing you to check your bid and win. 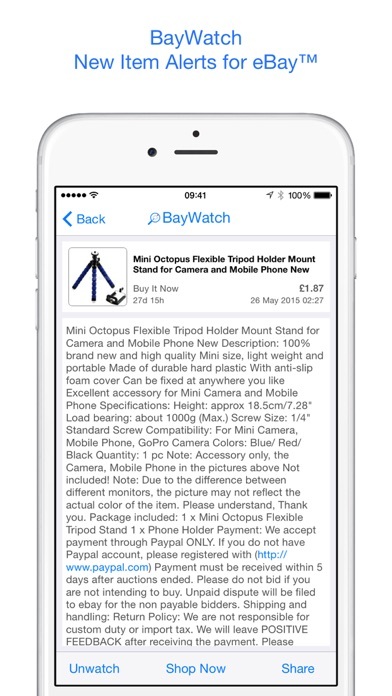 The essential app for finding rarely listed eBay items, and getting bargains at the best price. Find new eBay items first with BayWatch. This is a good app to get notices about an item on eBay especially if you were busy. For pay version you should get notices sooner than 15 minutes. I almost don’t want to tell me about it! For the most part pretty good. I have had some pretty good luck with this app, one thing I would really like to have are some different options for notification sounds. Randomly getting requested item watch notifications. Not getting ALL requested updates. You can’t buy this app, you rent by the month or year. Time saver is better than eBay saved feature. This app has been key to alerting me of when items I collect are posted. Get it. You won’t regret it. If you follow a ton of saved searches, do yourself a favor and give BayWatch a try. 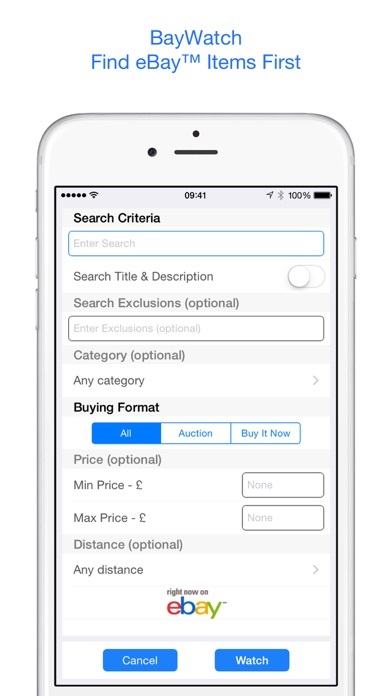 The saved searched are easily configured in a single screen that has the most important options when you buy often (local only, price range, excluded word filter, etc. ), and it informs you within minutes of new listings. You can then either delete found items so you don’t have to review over and over again, or watch them. While the app could use some more visual polish I found it very stable and working great; already found a bunch of great deals with newly listed items. The monthly fees for are definitely worth it if you are more than an occasional eBay buyer or if you’re looking for a great deal for a specific item that’s normally pricey. I have written in to the developer and they were responsive and friendly. Hope some features in the future include iCloud sync so you can browse the same stuff on multiple devices as well as small tweaks to the UI, like a “delete all” for search results.